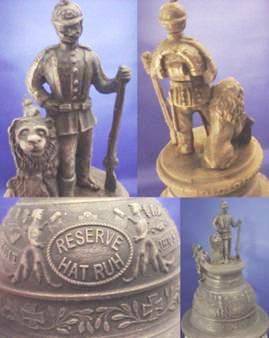 Okay my fellow collectors, the regimental stein reproducers are getting better! Two steins were recently bought by friends of mine on Ebay. They looked like the real thing in the photos, but both turned out to be brand new copies! 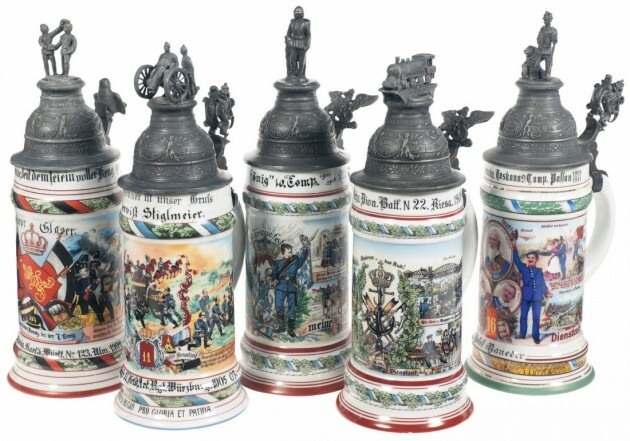 The stein maker’s are now using some sort of photographic reproduction to equal the hand paintings that were applied to the originals, i.e., the filling in of the name, unit designation, city and last parts of the dates of service. Below: I have shown the photos of the stein bodies of the [now] four we know of so far and I am certain there are more to follow. The only 100% positive ways of telling these through eBay / web site photos is to see if both the top and the inside of the lid are very dark (chemically aged) – the use of the lithophane below which is similar to, but different than the originals! And a new design for the front of the cast pewter lids – please see the photos far below. 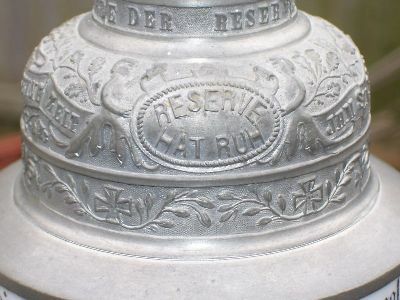 Above: A Wurttemberg infantry name to a Tambour (drummer), and it comes with a copy of the Ulm Wren thumblift –which was never done “on a reproduction” before. The lithophane on the repro stein above Very similar to the original and prior repros, except the soldier’s legs are really bow-legged. 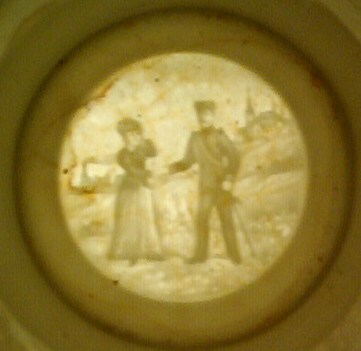 The lithophane in the “old “repros. 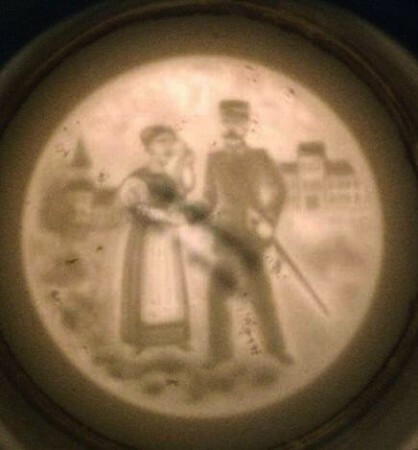 The lithophane from an original Saxon Uhlan stein. The lithophane from an original 83rd Infantry stein. 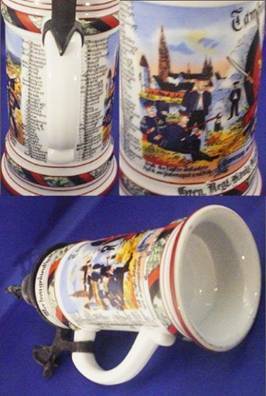 Above: The body scenes of a new Bavarian Field Artillery (howitzer) stein, comes with a “Kaiser’s prize (shooting prize) under the handle, not shown, but see notes about this later on. 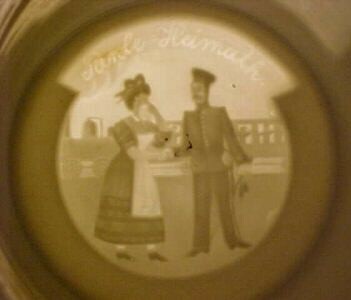 Almost the same lithophane (a bow-legged soldier and woman has her hand to her head!) It is usually seen with a “limp cannon” and the thumblift is leaning toward the rear and not erect either . The “limp cannon” will look a bit like this. It will not stay pointed up! No aged male comments please ! Above: The third one was spotted in 4-2008 = For a 16TH BAVARIAN INFANTRY REGT, 9 COMP, 1909 /1911, Named to: “JOSEF (JOFEF?) 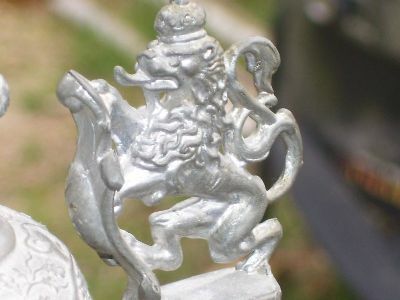 NANADER.” Lion and standing soldier finial, King Ludwig of Bavaria as the lithophane(as in originals.) Also four side scenes with 3 royalty portraits in the center. It has a hole in the thumblift where the “Stanhope” would have been on an original, a great faked technique. “Hi Steve, The Bavarian 5th Field Artillery copy is going to fool more than a few people. I have seen 4 of them for sale on eBay over the past several months and there is one on eBay now. 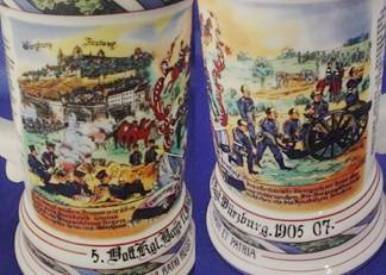 At least the seller of this one clearly states the stein is a copy. The wrong crown is on this Bavarian shooting contest emblem, which is on the artillery reproduction shown above. April 2011 – another one just spotted. It was listed for sale on eBay for $699.00 It sold for $300. With that big a drop in price, the buyer should have suspected something! 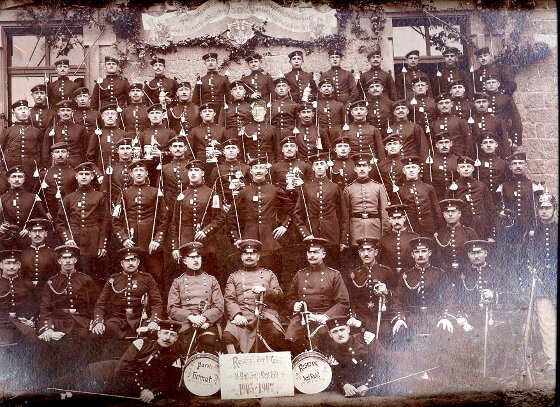 Repro: 23rd Bavarian Infantry – Named to a “Sanitats Soldier”, which means “Medic,” yet none of the scenes shown any Medic activity. Same wrong lid, as others above. 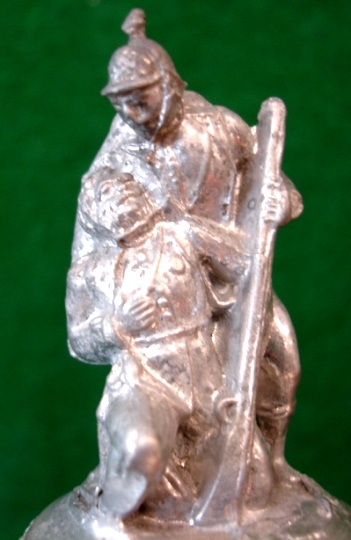 [L] Repro: A not very well done / defined copy of “The Wounded Comrade” finial. 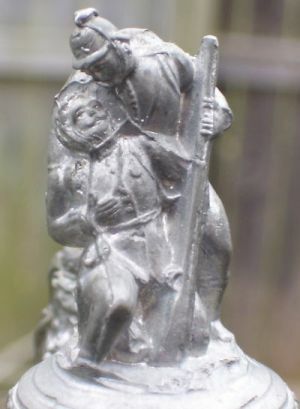 [R] ORIGINAL – all the pewter seams have been finished off = helmet, pants; the rifle is not bent, and one can make out detail of the injured soldier’s face. The lion and shield thumblift is correct and is now placed upright rather than leasning to the rear as on earlier models, BUT it is really rough and not finished 100%. Because it is a modern photo copy of an original photo, the photo of the officer in the middle of the body appears to be almost washed out. 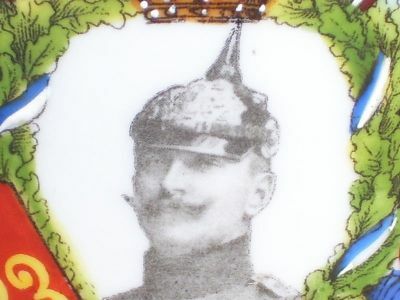 “The kicker”: A horrible rendition of King Ludwig of Bavaria as the lithophane. This glass reservist’s stein just showed up on the scene a few months back at a major USA astein uction house. 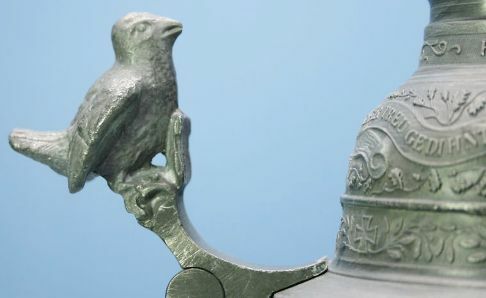 I haven’t looked it it in person BUT  No other one has been seen in 41 years,  the pewter (all of it ) shows no oxidation. The handle style looks too modern  the colors on the decal are not as bright as the older ones. I would have to look at it, real close up, ut I am certainly now going to pay $1300.00 plus for the privilege to do so. SEE PAGE 2 FOR PHOTOS OF SELECTED REPRODUCTIONS.